Charming holiday farm poised on the crest of a hilly expanse, amongst an olive grove, overlooking the small, enchanting city of Volterra, in poetic Tuscany. 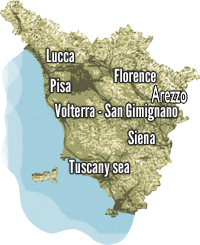 The Estates are a stone-walled farmhouse complex, renovated to today’s high-tech, eco-friendly building standards and at the same time holding fast to traditional Tuscan architectural norms. It offer spacious, comfortable apartments styled in traditional Tuscan architecture, characterized by sturdy wrought iron beds and timbered ceiling beams. Brightly sunlit living spaces are replete with modern conveniences: television, air conditioning and broadband Internet. Each apartment has its own private garden with direct access to the swimming pool and barbeque area. L’agriturismo è dotato di appartamenti spaziosi e confortevoli in tradizionale stile toscano con letti in ferro battuto e travi a vista. Gli ambienti sono luminosi e dotati di moderne comodità oggi imprescindibili: tv, forno a microonde, aria condizionata ed internet (wifi). Ciascun appartamento è dotato di giardino privato avente accesso diretto alla piscina ed al barbecue. I bagni sono tutti dotati di phon. V1037-1/2 Apartment (4 people+2) first floor with master bedroom, second bedroom with two single beds, styled kitchen in brickwork, living room with pullout sofabed, two shower bathrooms with windows, view overlooking the swimming pool and furnished private garden. V1037-3: Apartment (5 people +2) ground floor with its independent entranceway, this accommodation (certified for the disabled) has a master bedroom, second bedroom with three beds, kitchen in brickwork, a comfortable living room with pullout double sofabed,2 shower bathrooms, direct access to the swimming pool and private furnished garden. V1037-4-5: Apartment (2 peope +2) ground floor with its independent entranceway, this accommodation (certified for the disabled) has a master bedroom, kitchen in brickwork, a comfortable living room with pullout double sofabed, shower bathrooms, direct access to the swimming pool and private furnished garden. V1037- 6 Apartment (4 people+2) ground floor with master bedroom, second bedroom with two single beds, styled kitchen in brickwork, living room with pullout sofabed, shower bathroom with windows, furnished private garden. Price accommodations included: towels, bed linen (pillowcases, sheets, pillows, blankets), electricity, water, swimming pool (open from mid May to mid September).